Football Coaching experiences are available for all age groups and skill levels. Millions of people across the globe live and breathe Football. Whether that’s playing with friends or watching their heroes live at the local Stadium or on TV. Manchester is one of the world’s leading soccer cities, home to both Manchester United and Manchester City Football Clubs and the birthplace of the Football League in 1888. Read below and see how we can offer amazing Football Coaching experiences. Dates and prices available on request. Arrive at Manchester airport where your tour manager will meet you on arrival. Enjoy a panoramic city tour of Manchester before checking-in into the 4 star Hotel Football (subject to availability), a unique football-themed hotel overlooking Manchester United’s Old Trafford stadium. 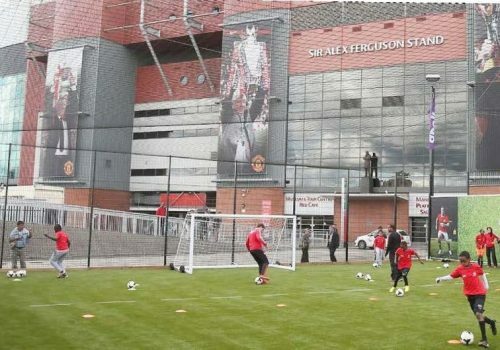 Enjoy a welcome evening at Manchester United stadium including a private museum and stadium tour, a meet and greet with Manchester United’s mascot Fred the Red and receive an official Manchester United shirt with your name printed on it. This evening, you will have dinner in Manchester United Red Café. Start your day with a morning soccer coaching session with official FA coaching staff at a local all weather training facility. In the afternoon, enjoy a tour of either Manchester City’s Etihad or Liverpool’s Anfield Stadium. This evening, you will have dinner in the Red Café at Old Trafford. In the morning take part in soccer coaching and skills sessions hosted by official FA official coaches. This is followed by a lecture from a qualified Manchester United Football Club member of staff. Learn all about modern dayPlayer Development, Nutrition, Training, Player Liaison and much more. Later, enjoy a guided tour of the world famous National Football Museum in central Manchester with a host of football memorabilia aswell as interactive skill tests and simulators. In the morning enjoy another coaching skills session with official FA coaching staff at a local all-weather pitch. This is followed by a friendly game against a local Manchester soccer team of a similar age group. You will have the afternoon at leisure before attending a farewell dinner at the Manchester United Red Cafe. It will be a night to remember with a special quiz about Manchester United Football Club, an awards ceremony and trophy presentation. A Manchester United Legend will also make an appearance! Today you will leave Manchester and Old Trafford with a lot of wonderful memories and new skills! Make your way to Manchester airport for your flight home.